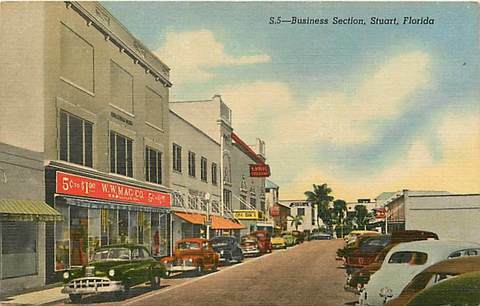 Stuart is an attractive and bustling town of about 16,000 people located on what in recent years has been designated as the "Treasure Coast". It is located on the east coast of Florida about halfway between north Palm Beach County and Vero Beach. Hundreds of years ago many Spanish galleons were lost in storms off the coast of this area, and millions of dollars in gold and silver went down with the ships. Treasure has been discovered off and on over the years, and people are still looking. Modern treasure for Stuart and Martin County comes from the many new upscale waterfront and golf course developments, and from the town's wonderful location where Hobe Sound and Indian River Lagoon come together at St. Lucie Inlet and the Atlantic Ocean. The town is surrounded by water: the St. Lucie River has a north fork and south fork; Manatee Pocket is a natural hurricane harbor located just south of St. Lucie Inlet with the small fishing village of Port Salerno. Sewell's Point is an elegant older Stuart neighborhood with the Indian River Lagoon on its east and the St. Lucie River to its west. As one drives around Stuart, it is hard not to be near beautiful water. 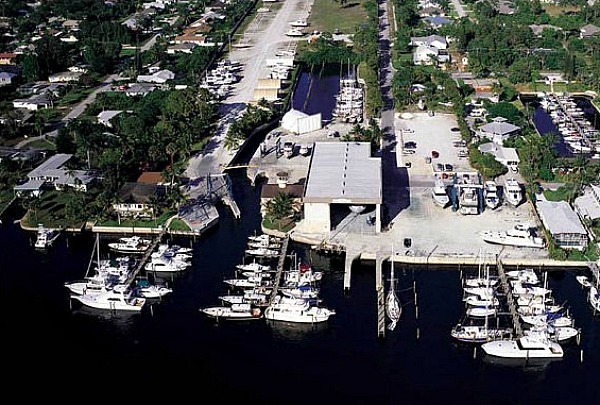 This abundance of waterfront has made Stuart a marine service center. 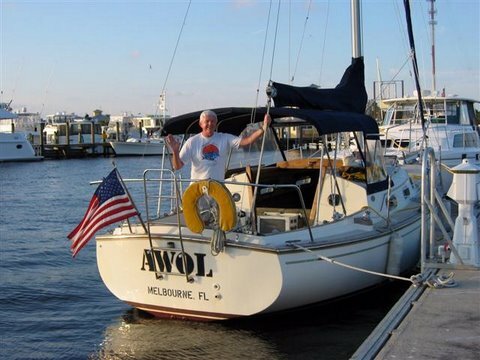 There are several first class marinas and boatyards in the area, and a charter fishing fleet that specializes in taking sport fishing enthusiasts out to battle and catch sailfish in the ocean. The beautiful beaches of the Atlantic Ocean are nearby at Jensen Beach and Hutchinson Island. Stuart is truly a magical place. 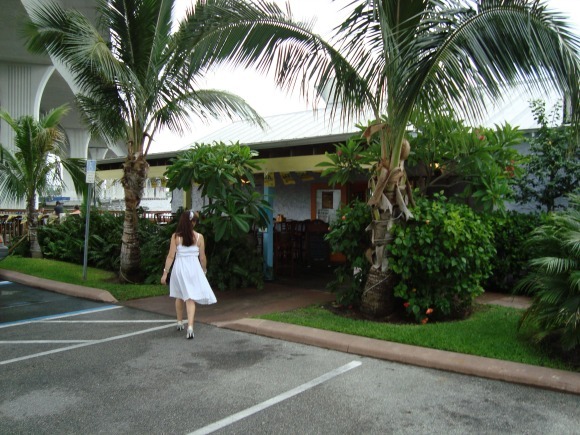 Port Salerno is a residential and fishing village in unincorporated Martin County on the south side of Stuart. It is located along the waters of the St. Lucie River near the inlet to the Atlantic Ocean. 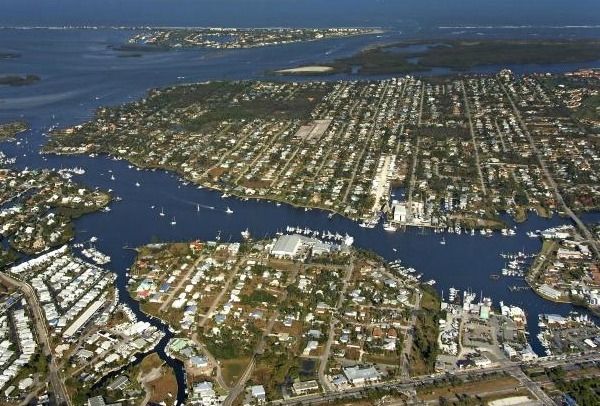 Its waterfront district is located at the south end of Manatee Pocket. The main highway through town is State Road A1A and the waterfront district is adjacent to the highway. You can see the district in the lower right hand corner of the aerial photo below. Manatee Pocket is well known by boaters as a natural "hurricane hole", as good a place to take shelter in a bad storm as any harbor along the east coast of Florida. The shoreline of Manatee Pocket is busy with fishing related enterprises like charter boats, commercial fishing boats, marinas, boatyards, and seafood restaurants. Port Salerno was founded in 1894 as Salerno and the "Port" was added in 1924. The name had been chosen by some of the earlier settlers who were from the Italian town of Salerno. Most people in the early years made their livings by fishing commercically or working in nearby pineapple farms. 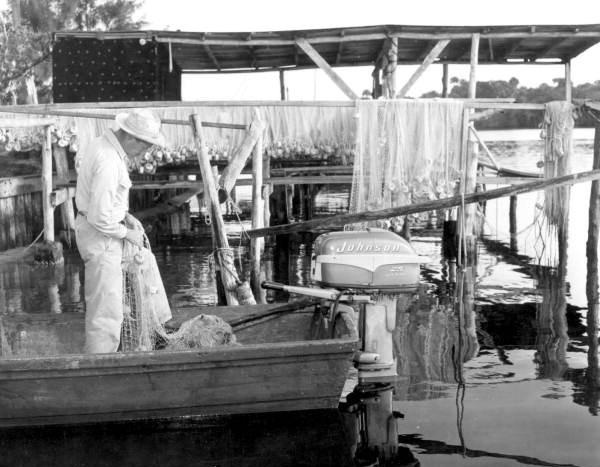 In the 1930s, Port Salerno became well known for its shark industry. The population of the Port Salerno area is about 10,000, but it is contiguous with the larger and busier Stuart and is often considered part of that town. The residential areas are east of the waterfront district on a large peninsula separated from nearby Jupiter Island by Great Pocket, a section of the Intracoastal Waterway. Many cruising yachts stay at the marinas in the area during the winter; others stay there year around. Fishing with large nets was banned by the State in 1995, and the commercial fishing industry was devastated. Since then, the marine industry has taken the place of many of the commercial fishing establishments. Although marinas and boat yards are all over the area, commercial fishing is still important to the town's economy. 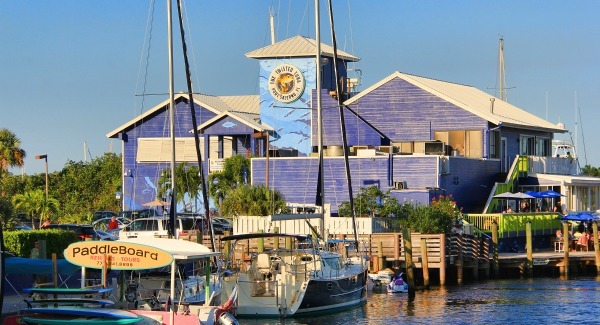 People today like to visit the area's many nautical shops and seafood restaurants. Martin County government and local citizens have been busy in recent years with preservation and improvement projects. An example is the Manatee Pocket walk, a board walk around a portion of the Manatee Pocket waterway. 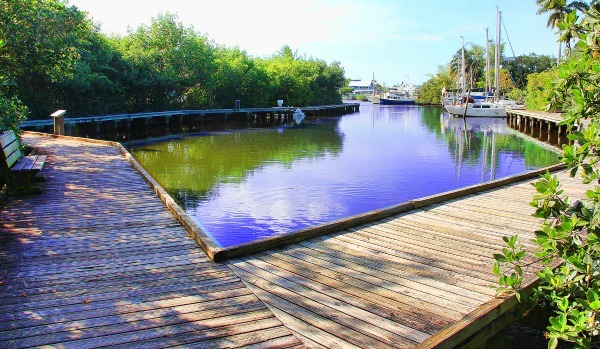 The goal of these projects has been to preserve the historic fishing village feel of the town and not let it become just another overcrowded Florida waterfront. 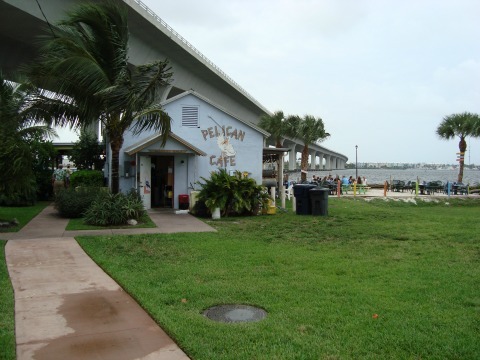 Pelican Cafe and Beach is a casual dining place on the St Lucie River in downtown Stuart. It features outside dining with a great expansive view of the river at the base of the high rise bridge that crosses the river. The restaurant is on the north end of the historic Stuart downtown district. If you have a dog, bring him or her along too. Dogs are welcome and seem to enjoy the view as much as their owners. You will be perfectly dressed if you wear shorts, tee shirt and flip flops. All of the seating is outside under umbrellas. You can choose to sit on the deck at the base of the bridge, or in the sandy beach area. If you are a connoisseur of bikini clad young women, the beach area might be your cup of tea. If you are offended by beach attire, then the deck is for you. Once in a while weather conditions will force the owners to close the cafe. If it's too windy or a rainy day of long duration, they might close. If you notice the weather isn't great, you should call the restaurant to make sure they're open. They have a huge menu for a place this small. You can have chowder, shrimp, chicken wings, hamburgers, chili, calamari, conch fritters, short ribs, Greek salad, fish tacos, blackened fish, hot dogs, mussels and you name it. I've just scratched the surface of their menu. I enjoyed conch fritters as an appetizer, and a tasty salmon entree with the fish wrapped in banana leaf and served with Bahamian style rice and steamed vegetables. It was very good and reasonably priced. I had a Budweiser with the meal; they serve beer and wine only. Kimie was my server, and she was attentive and very bright. She served a special treat called a "short rib turnover" that was absolutely delicious. It's kind of a cross between a dessert and a meat pie; sweet flavor, stuffed with shredded meat that I assume was beef. Whatever it was, it was great. This neat little place has such a large and varied menu that there seems to be something for every taste. 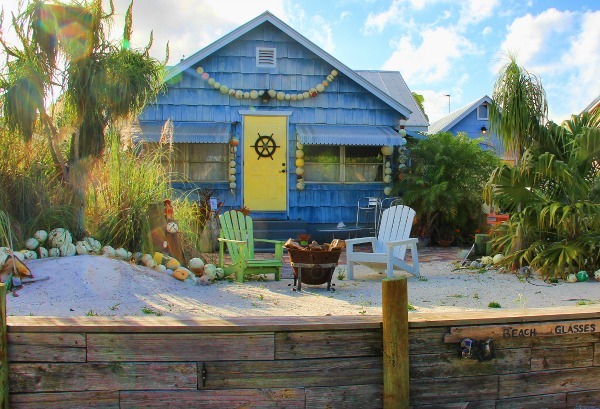 The Twisted Tuna is on the shoreline of Port Salerno, a historic Florida fishing village. It offers a beautiful view of the water that surrounds it on two sides, and is well known for its delicious seafood offerings. You can visit the restaurant by land or on a boat. The interior is bright and open, and you have your choice of dining inside or outside on one of the decks. The menu features something for everyone, but seafood is the specialty of the house. The atmosphere is friendly and inviting, and the service is great. The restaurant and bar quite often feature local musicians. Some of their menu items include tuna based appetizers along with my favorite, Conch Ceviche. You can also get cracked conch and conch fritters, Oysters Rockefeller and Twisted Calamari. They have a raw bar, too, and a wide selection of soups and salads and even feature sushi. Entrees include several kinds of steamed seafood platters and a large variety of fried baskets. Other entrees feature various fish, shrimp or chicken tacos and a huge variety of sandwiches and wraps. 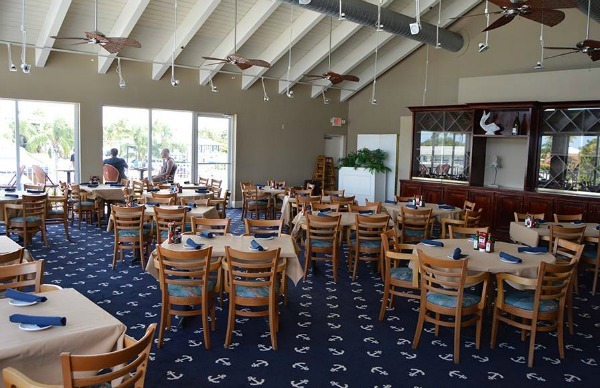 Fish dinners feature grouper, mahi-mahi, snapper, salmon and they will even cook your own catch for you. Landlubbers are not forgotten with an 8 ounce filet mignon, various chicken dishes, and a surf and turf feature with lobster tail. To cap it all off, Italian fans will love their large selection of pasta dishes and their brick oven pizza. They also have a gluten free menu. The Twisted Tuna Cafe is open at 1100 am seven days a week, and closes at midnight except for Fridays and Saturdays when it stays open until 100 am. On Sunday they take it easy and close at 1100 pm.